ZINNIA is my second book, also with a wonderful publisher, Salina Bookshelf of Flagstaff, AZ. And I love Kendrick Benally’s illustrations. I am the first non-Navajo author that Salina Bookshelf has published, and I feel honored that they chose my story. 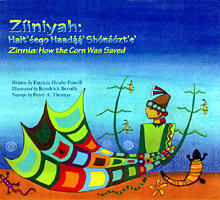 Zinnia is a Land of Enchantment Children’s Book 2006-07. The process of ZINNIA’s publication has been a very different experience than that of BLOSSOM TALES with Moon Mountain, from my standpoint. The BLOSSOM TALES illustrations were sent to me on-line by the publisher (Moon Mountain) as Sarah Dillard (the illustrator) completed them, and then refined them, over the course of a year. For ZINNIA, I didn’t have an inkling of the illustrations until Salina sent me the completed color proof in the form of a scroll (rather than a folded book). I was floored. The illustrations are brilliant and gorgeous. And the book came out less than two months later. In fact, Erik Lockard, the Salina Bookshelf publisher, accompanied Kendrick’s artwork to Hong Kong where the book was printed (most picture books are printed in eastern Asia), in order to be assured that the colors came out true. I have subsequently learned that turquoise is a difficult color to reproduce. ZINNIA is loaded with turquoise, but also magenta, purple, greens, oranges and yellow. I’m going outside now to plant some corn amongst my yellow zinnias.